Moving your network into the next phase of SCSI solutions? Look no further than Tripp Lite's brand of SCSI U320/U160 cables. Supports all legacy transfer rates including Ultra 320 . Multi-platform SCSI III external peripheral cable, offset VHDCI68M/HD68M. 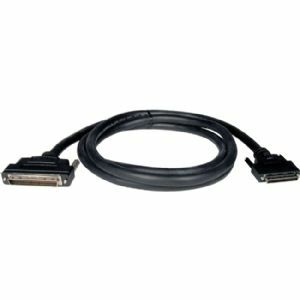 This 10ft cable is designed to connect two SCSI III (fast and wide) or SCSI II devices together. Manufactured using double shielded 34 twisted pair high impedance cable. Constructed with low-capacitance, impedance matched, 28 AWG, stranded, tinned copper cable with insulated in polypropylene. Tripp Lite warrants this product to be free from defects in materials and workmanship for life.